Former US President George H.W. Bush has spent Christmas with his wife Barabara and other family members in a Houston hospital after developing a fever and weakness following a monthlong, bronchitis-like cough, his spokesman said Monday. A hospital spokesman had said George H.W. 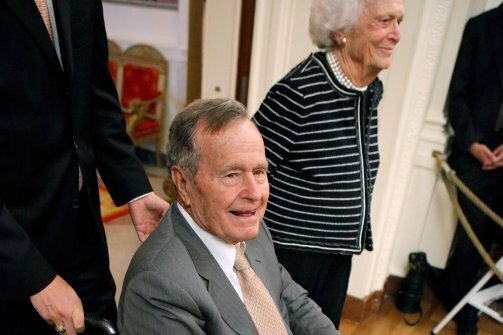 Bush, 88, would be released in time to spend the holiday at home, but that changed after he developed a fever. “He’s had a few setbacks. Late last week, he had a few low-energy days followed by a low-grade fever,” Jim McGrath, George H.W. Bush’s spokesman in Houston, told The Associated Press. Jim McGrath said the cough that initially brought George H.W. Bush to the hospital on November 23 is now evident only about once a day, and the fever appears to be under control, although doctors are still working to get the right balance in Bush’s medications. No discharge date has been set. “Given his current condition, doctors just want to hang on to him,” Jim McGrath said, adding that he didn’t know what had caused the fever. George H.W. Bush’s wife, Barbara, his son, Neil, and Neil’s wife, Maria, are expected to visit on Christmas, Jim McGrath said. Since he was hospitalized, George H.W. Bush has been visited by many of his children and grandchildren, including former President George W. Bush, who came twice, and former Florida Gov Jeb Bush, Jim McGrath said. With 37 members in the immediate family, George H.W. Bush has received many emails and phone calls, Jim McGrath said. George H. W. Bush, the nation’s 41st president, and his wife, Barbara, live in Houston during the winter and spend their summers in a home in Kennebunkport, Maine. The former president was a naval aviator in World War II – at one point the youngest in the Navy – and was shot down over the Pacific. He achieved notoriety in retirement for skydiving on at least three of his birthdays since leaving the White House in 1992. Being in the hospital for such a long time has not been easy for George H. W. Bush, who is accustomed to being active, Jim McGrath said. But the president has said he’s determined “not to get grumpy about it”.